Based on a report by Adobe, 33.5% of Black Friday transactions made online in the U.S., were closed on a smartphone. That was up over 15% from the 29.1% of sales that were completed over a smartphone during Black Friday 2017. Going into the biggest shopping day of the year, Adobe forecast that 48% of all visits to online stores would come from consumers browsing on their phones, with another 9% coming from shoppers using their tablets. That compares to the 43% of visits expected from desktop users. 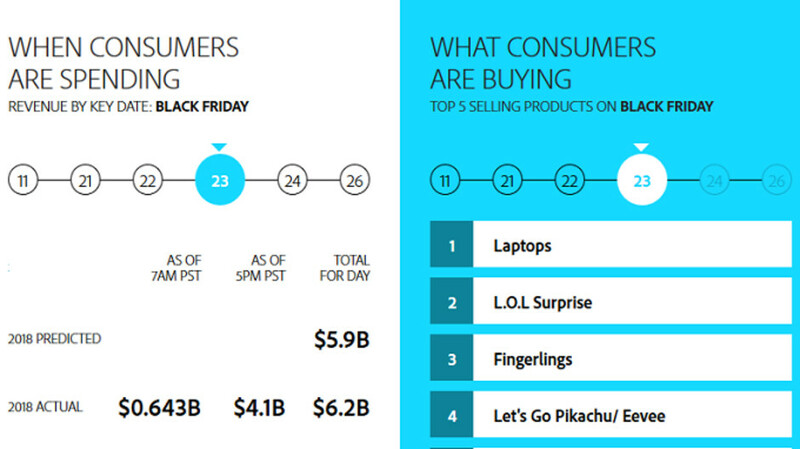 Adobe says that the top five products purchased online in the states on Black Friday were Laptops, LOL Surprise dolls and accessories, Fingerlings baby pet toys for kids, the new Let's Go Pikachu/Evee Pokemon games, and the God Of War video game. Based on transactions made at 80 of the top 100 retail websites in the U.S., Black Friday sales online topped estimates at $6.2 billion. That was up 23.6% year-over-year. It also means that revenue from sales made on smartphones amounted to $2.1 billion for the day. There are a few factors that explain why more Black Friday purchases were made over smartphones this year. First, screens on connected handsets are getting larger, which improves the experience of shopping over a phone. Secondly, faster processors and more RAM allow consumers to comparison shop and pull the trigger on purchases more easily. And lastly, more online retailers have mobile versions of their websites, designed specifically for smartphones and tablets. I got fingerlings and lol for my kids.